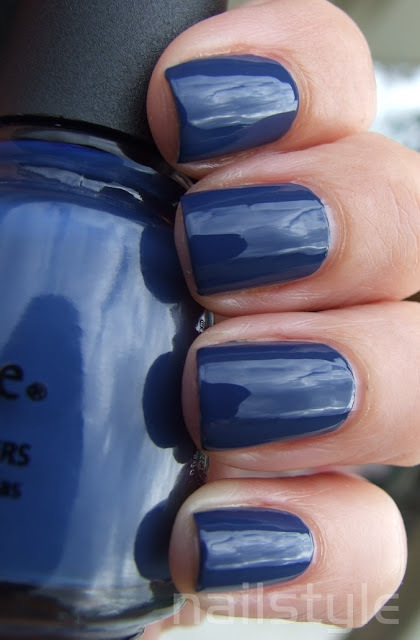 Todays manicure is China Glaze's First Mate which is a dusty royal blue creme. First Mate applies beautifully and is almost a one coater. I love these ultra pigmented polishes! This is an unusual blue that goes well with jeans in my opinion. And just 'cos I wanted to see how it would look matte . . . topped with Essie Matte About You. Interesting how it totally changed the colour of the blue. Goodness! Both the polish and the manicure are stunning!! I bought on Ebay for $ 25, sending me out quite expensive, but worth the price of my happiness. Seems an old collection that is why it is so expensive. When I see something of yours here, I am sure you have done a good deal. I loved, it was beautiful! I love the blue. The matte look is awesome with the stamp! Holy Crap-this is awesome!! I have that first mate-don't think I've even worn it yet! But your stamping is perfection! I love that design-need to get it! Love this design and colors!